The Joker, Harley Quinn, and Poison Ivy are wreaking havoc! Now, in a race against time, Batman must speed through Gotham City in the Batmobile to stop them! 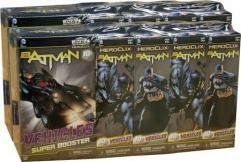 DC HeroClix: Batman features popular sub-themes like Batman Inc., the Outsiders, and the introduction of the WildC.A.T.S., plus Super-Boosters with all-new vehicles like the Batmobile and the Invisible Jet. Super Boosters contain 1 vehicle figure.